If you raise your vehicle, always ensure that it is supported at all four jacking or lift points for the vehicle. Do not use jacks meant for tire changes. Use only lift equipment specifically recommended for doing maintenance work under the vehicle. Place the vehicle and lift equipment on a hard, level surface capable of supporting the full wight of the vehicle without moving or deforming. If the support is not stable, the vehicle could fall and cause serious or fatal injuries. Follow the instructions with the lift device. 2. Remove the fill/check plug on the side of the transaxle. 3. 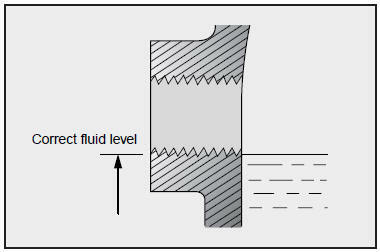 Verify that the oil level reaches the bottom of the fill/check hole. Fill as necessary. 4. Install a new washer on the fill/check plug and tighten the plug to 22 lb•ft. (30 N•m).